Star Cinema's CINCO will surely be a mass favorite. Starring Wowowee hosts Pokwang and Marielle Rodriguez, young drama stars Maja Salvador, Rayver Cruz, Bangs Garcia, Jodi Sta. Maria and Zanjoe Marudo, and Kapamilya teen stars Sam Concepcion, AJ Perez and Robi Domingo, their own fans will undoubtedly support the first five-story horror flick in the country. Talking about the movie concept, Star Cinema may have got it from the long time MMFF Regal horror flick series Shake, Rattle and Roll. But, the five-story CINCO has a lot more screaming and suspense scenes as compared to the triple treat horror concepts with SRR. I personally like the 'Braso' episode of teenage stars Sam, AJ and Robi. Based on the premier night held at the SM Megamall A Cinema 10, the hot young bods of the three teens along with their scenes in the morgue was one of those who got the loudest scream from the audience. Jodi Sta. Maria's 'Paa' episode is also one of the episodes with the best suspense scenes. While Pokwang's episode is, I guess, the crowd favorite. I could honestly say that among the five episodes, hers is the best for this movie genre. This might be the reason why they make her cut in the movie as the finale. The Maja Salvador-Rayver Cruz reunion team up in the episode 'Mata' has the less suspense shots but should never be underestimate. Also, Marielle Rodriguez's scene has non-screaming moments but gained the crowd's applause due to her 'maldita' effect in her role. I also noticed that the five stories has connections to each other. Notice the dead lady sucking a thumb in the first episode 'Braso' and was later on shown as part of Pokwang's episode in the finale. Overall, I expect the movie to be attention-getter. With the powerhouse cast, it will never be a surprise if this could be the blockbuster horror movie of the year! CINCO is directed by five promising horror directors Cathy Garcia-Molina, Frasco Mortiz, Enrico Santos, Ato Bautista and Nick Olanka. Catch the movie starting today, July 14 on cinemas nationwide. Watch out also for their international screening in Guam. 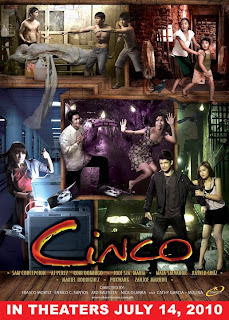 Visit their website www.cinco.starcinema.com.ph for more updates about the movie. LOL! that's not how to do a movie review. yeah. spoiler. but since it's done showing, i'll spoil a bit more. unlike this review, i didn't enjoy braso. it has the narrowest story of them all. the actors were really bad (except baron geisler who shows his natural ability to look scary). if it's just the "hot" body that you are looking at, then request for these dudes to be in another movie, not in a horror flick. jodi sta. maria was excellent. the setting, lighting, story line and characters were the best. never-ending thrills and screams. a battle of conscience and blood. rayver and maja were good as well. the story wasn't scary, but the director did an excellent job in keeping it interesting. the unending repetitions were superb, and all the actors were in character. mariel's story was okay. the "jingle bell" music made it a bit scary. i agree, mariel was definitely maldita in this flick. i pity mang bong a lot, specially in the scene where he was about to commit suicide and he was soaking in the rain. he should've killed mariel in the end to make it more interesting. LOL. the best story was pokwang's part. eventhough her side-kick, empoy, was so lame with his acting and her loveteam zanjoe wasn't good as well, pokwang pretty much handled the whole story. this was a typical "gayuma" story (ugly girl being inlove with a handsome guy but handsome guy is also inlove with a hot girl so ugly girl tries to make him hers by using a love potion) but the twist made it unique. all in all, i'll give this movie a "cinco" rating. meaning, it's the fifth most scary filipino flcik for me. Feng Shui, Patayin sa Sindak si Barbara, Sukob and Judy Anne Santos' MMK "sanib" series were better than this one.